My favorite tools and adhesives when assembling 3D models. When assembling 3d models you have to have a glue enough strong to hold the parts together. I prefer to use adhesive tape prior to wet glue because I do not like to wait for the wet glue to dry and wet glue can make cardboard wavy if you use too much. 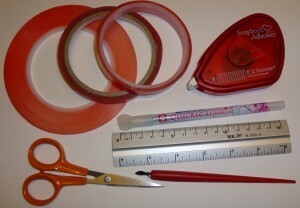 Adhesive tapes are available in different varieties. You need one that is extra strong for it to hold. For small or thin parts a glue pen is perfect. I use the ruler mainly to scrape off small pieces from the cutting mat, not so often for measuring.